microRNA (miRNA) are short, noncoding RNA that negatively regulate gene expression and may play a causal role in invasive breast cancer. Since many genetic aberrations of invasive disease are detectable in early stages, we hypothesized that miRNA expression dysregulation and the predicted changes in gene expression might also be found in early breast neoplasias. Expression profiling of 365 miRNA by real-time quantitative polymerase chain reaction assay was combined with laser capture microdissection to obtain an epithelium-specific miRNA expression signature of normal breast epithelium from reduction mammoplasty (RM) (n = 9) and of paired samples of histologically normal epithelium (HN) and ductal carcinoma in situ (DCIS) (n = 16). To determine how miRNA may control the expression of codysregulated mRNA, we also performed gene expression microarray analysis in the same paired HN and DCIS samples and integrated this with miRNA target prediction. We further validated several target pairs by modulating the expression levels of miRNA in MCF7 cells and measured the expression of target mRNA and proteins. Thirty-five miRNA were aberrantly expressed between RM, HN and DCIS. Twenty-nine miRNA and 420 mRNA were aberrantly expressed between HN and DCIS. Combining these two data sets with miRNA target prediction, we identified two established target pairs (miR-195:CCND1 and miR-21:NFIB) and tested several novel miRNA:mRNA target pairs. Overexpression of the putative tumor suppressor miR-125b, which is underexpressed in DCIS, repressed the expression of MEMO1, which is required for ErbB2-driven cell motility (also a target of miR-125b), and NRIP1/RIP140, which modulates the transcriptional activity of the estrogen receptor. Knockdown of the putative oncogenic miRNA miR-182 and miR-183, both highly overexpressed in DCIS, increased the expression of chromobox homolog 7 (CBX7) (which regulates E-cadherin expression), DOK4, NMT2 and EGR1. Augmentation of CBX7 by knockdown of miR-182 expression, in turn, positively regulated the expression of E-cadherin, a key protein involved in maintaining normal epithelial cell morphology, which is commonly lost during neoplastic progression. These data provide the first miRNA expression profile of normal breast epithelium and of preinvasive breast carcinoma. Further, we demonstrate that altered miRNA expression can modulate gene expression changes that characterize these early cancers. We conclude that miRNA dysregulation likely plays a substantial role in early breast cancer development. Considerable molecular pathology research has focused on invasive breast cancer (IBC); however, less attention has been given to the preinvasive nonobligate precursor, ductal carcinoma in situ (DCIS). DCIS is the fourth most common cancer diagnosis among women and is present in the vast majority of IBC cases . Women diagnosed with DCIS are at an increased risk of subsequently developing IBC, and, when examined, DCIS and IBC also share many of the same genetic features. However, there is an increased need to better understand the early genetic events and identify biomarkers that are present prior to IBC. microRNA (miRNA) have emerged as a new class of gene regulators that may serve as both molecular biomarkers and novel therapeutic targets. 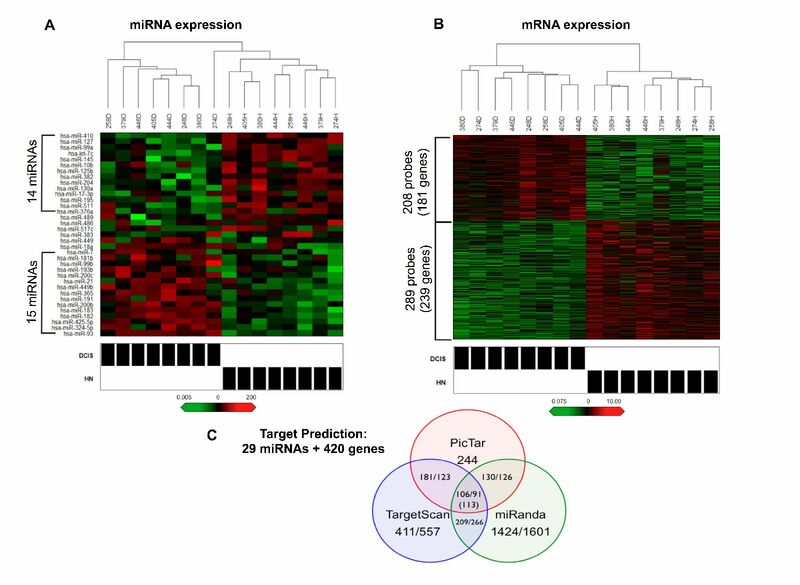 In this study, we sought to investigate miRNA expression changes and their consequences in preinvasive breast cancer. miRNA are short, non-protein-coding RNA that exert posttranscriptional control over their mRNA targets through the mechanism of RNA interference. By complementary binding to the 3' untranslated region of target mRNA, miRNA promote mRNA destabilization, thereby inducing translational repression . It has been demonstrated that miRNA control major cellular processes, including metabolism, developmental timing, stem cell division, cell growth and differentiation and apoptosis [3–5]. Given this expansive role, it is unsurprising that their effect on mRNA expression contributes to the pathogenesis of many diseases, including cancer [6, 7]. To date, more than 900 miRNA have been identified in humans, constituting more than 1% of the total coding genome. It is predicted that more than 60% of mRNA may be targeted and that a single miRNA may target as many as 200 mRNA, thus making miRNA the largest class of gene regulators [8–10]. Several studies have established the role of miRNA in the pathogenesis of IBC. For example, abnormal miRNA expression has been described in breast cancer cell lines and in bulk primary normal and cancerous breast tissues [11–13]. In this setting, miRNA expression has correlated with specific breast cancer biopathologic features, such as estrogen receptor (ER) and progesterone receptor (PR) expression, tumor stage, vascular invasion or proliferation index. In addition, many miRNA that are consistently downregulated may act as tumor suppressors, for example, miR-206, miR-17-5p, miR-125a, miR-125b and the let-7 family, and many that are consistently upregulated may acts as oncogenes, for example, miR-21, miR-10b and miR-27a. Other studies have shown that miRNA exhibit a specific spatial distribution of expression within breast epithelium . Almost all human breast cancers arise in the epithelial compartment, likely as a result of the transformation of epithelial cells, although the surrounding stroma and microenvironment play a crucial role in tumor progression. Therefore, the present work is focused on the genetic changes that occur within the epithelial cell population. We hypothesized that miRNA expression might be dysregulated prior to IBC, that these changes might be associated with mRNA expression changes and that together these might help to elucidate important steps in early breast tumorigenesis. Therefore, to first obtain a profile of normal miRNA expression, we profiled miRNA in normal epithelium from healthy controls undergoing reduction mammoplasty (RM). Next, to obtain a profile of miRNA dysregulated prior to invasion, we examined miRNA expression in histologically normal (HN) epithelium and compared this to paired samples of adjacent DCIS. We then integrated the HN:DCIS miRNA expression profile with the gene expression profile from the same samples and used miRNA target prediction programs to identify putative miRNA:mRNA functional interactions. We then selected three candidate miRNA (miR-125b, miR-182 and miR-183) and six of their putative target genes (MEMO1, NRIP1, CBX7, DOK4, NMT2, and EGR1) for validation. This study represents the first report of a miRNA expression profile in normal breast epithelium and the first integrated analysis of dysregulated miRNA and mRNA expression in paired HN and DCIS samples. Many of the dysregulated miRNA identified in DCIS have previously been identified in IBC. Our data suggest an important role for miRNA in determining the parallel gene expression changes that characterize the earliest stage of breast disease. Primary breast tissues not needed for diagnosis were obtained at Boston Medical Center from patients undergoing RM and breast cancer surgery (prior to any chemo- or radiation therapy). All samples were deidentified and assigned a number at the time of collection; therefore, informed consent was not required according to our specimen collection protocol preapproved by the Boston University Medical Center Institutional Review Board. Samples were processed as described previously . Epithelia from three groups were examined: normal breast tissue (n = 9) from RM (mean age, 52.2 years; age range, 44 to 75 years) and paired samples of HN and DCIS (n = 16) from eight individuals undergoing cancer surgery. Hematoxylin and eosin-stained sections were reviewed by a pathologist (AdlM) to verify normal epithelia and preinvasive lesions. Laser capture microdissection (LCM) was performed as described previously [15–17] to collect breast epithelial cells of normal appearing ductal tissue (RM and HN) and epithelial cells of identified regions of DCIS. Total RNA was isolated using the RNAqueous miRNA Isolation Kit (Ambion, Austin, TX, USA) and treated with DNase I according to the manufacturer's instructions. RNA to be utilized for gene expression analysis was processed as described previously [15, 16]. The pooled RM sample was prepared by combining 400 ng of total RNA from each of the nine RM samples. cDNA was synthesized from 800 ng (100 ng/multiplex pool) with the TaqMan miRNA Reverse Transcription Kit (Applied Biosystems, Foster City, CA, USA), according to manufacturer's instructions. miRNA expression was measured by real-time quantitative polymerase chain reaction (RT-qPCR) assay utilizing the TaqMan Human miRNA Array Panel (version 1.0, based on miRBase version 9.2; Applied Biosystems) and assayed on the 7900 Real-Time PCR System (Applied Biosystems), according to the manufacturer's instructions. miRNA expression data are available from the National Center for Biotechnology Gene Expression Omnibus (GEO)  at accession number [GEO:GSE24509]. All probes with threshold cycles (Ct) = 40 in more than two of three pooled RM (PRM) replicates or more than six of eight HN samples and more than six of eight DCIS samples were considered "nonexpressed" and removed. Remaining Ct values were global median normalized by transforming all expression values by rescaling to a target value of 12 (ΔCt). Relative changes in miRNA expression among each comparison (HN-PRM, DCIS-PRM and DCIS-HN) were assessed (ΔΔCt ). A variance correction was applied to account for the pooled samples as suggested by Churchill , and a t-test was performed. P < 0.005 in at least one of the comparisons was considered statistically significant. To address the issue of multiple comparisons, we highlight the results that remain significant using two valid procedures: the more restrictive Bonferroni correction (P < 0.00025) and the less restrictive false discovery rate < 0.05 (P < 0.017), which typically results in a greater number of significant results. The relative fold change for each comparison was calculated by 2^-ΔΔCt. Heatmaps were generated using the Heatplus package in Bioconductor . Gene expression analysis was measured on the U133A GeneChip (Affymetrix, Santa Clara, CA, USA). All microarray analyses were performed at the Boston University Microarray Facility as previously described . The paired data were assembled as follows: 12 paired samples (six HN and six DCIS) were pulled from the data published by Emery et al. , two HN samples were pulled from the data published by Graham et al. , and the two matching pairs of DCIS samples (combined to equal 16 paired samples) were collected and processed from tissue acquired from the same patient. Array data were analyzed as previously described . Microarray output data were filtered by removing all probe sets present in < 15% of all samples. Next, data were analyzed by performing Bayesian Analysis of Differential Gene Expression (BADGE) as previously described by Emery et al. and found online at the BADGE website . The gene expression data are available from GEO under accession number [GEO:GSE24509]. SigTerms  was utilized to extract predictions from PicTar , TargetScan (4.1 and 5.1)  and miRanda (Jan 08 and Sep 08) . miRNA target predictions were extracted two separate times, the first using TargetScan release 4.1 and miRanda release Jan 08 and the second using TargetScan release 5.1 and miRanda release Sep 08. The final prediction results are a combination of the two queries. Pearson correlations and associated P values were calculated across all 16 HN and DCIS samples for each of the target pairs identified from the intersection of the programs. Gene annotation, ontology and pathway analysis were conducted using the Database for Annotation, Visualization and Integrated Discovery . A modified Fisher's exact test/EASE (Enrichment) Score was utilized to calculate the P-values. MCF7 cells were kindly provided by G. Sonenshein (Tufts-New England Medical Center, Boston, MA, USA) and were maintained in Dulbecco's modified Eagle's medium (Invitrogen, Carlsbad, CA, USA) with 4.5 g/l glucose and sodium pyruvate supplemented with 5.8 g/l L-glutamine (Cellgro, Manassas, VA, USA), 10% fetal bovine serum (Sigma-Aldrich, St. Louis, MO, USA) and 1% penicillin-streptomycin (Cellgro). For all experiments, 5 × 104 cells/well of a 12-well plate were seeded for 24 hours and then transfected with (1) 100 nM pre-miR-125b or scrambled negative control sequence (Scramble) or (2) 50 nM Anti-miR-182, Anti-miR-183 or Scramble using the siPORT NeoFX Transfection Agent (Ambion). Cells were rinsed with 1× phosphate-buffered saline (PBS) and lysed with 600 μl of lysis buffer, and total RNA was isolated with the mirVana Isolation Kit (Ambion) and treated with DNase I, according to the manufacturer's instructions. RNA quantity was determined using Quant-it RiboGreen RNA Quantitation Reagent (Invitrogen) according to the manufacturer's instructions. cDNA from 500 ng of total RNA was synthesized using TaqMan RT reagents according to the manufacturer's instructions. qRT-PCR was performed by diluting RT product in 2× Universal PCR MasterMix and 20× TaqMan Gene Expression Assay for each gene to be measured: chromobox homolog 7 (CBX7) (Hs00980916_g1), docking protein 4 (DOK4) (Hs00902919_g1), early growth response 1 (EGR1) (Hs00152928_m1), glyceraldehyde 3-phosphate dehydrogenase (GAPDH) (4333764F), mediator of ErbB2-driven cell motility (MEMO1) (Hs00831646_uH), N-myristoyltransferase 2 (NMT2) (Hs01013924_g1) and nuclear receptor-interacting protein 1 (NRIP1/RIP140) (Hs00942766_s1). PCR reactions were run on the 7500 real-time PCR instrument under the following conditions: hold at 95°C for 10 minutes, then 40 cycles of 95°C for 15 seconds and 60°C for 1 minute. All reagents were purchased from Applied Biosystems. Relative gene expression was assessed using the differences in normalized Ct (ΔΔCt) method after normalization to GAPDH. Fold changes were calculated by 2^-ΔΔCt. Cells were washed with 1× PBS 48 hours posttransfection and collected in radioimmunoprecipitation assay buffer (25 mM Tris-HCl, pH 7.6, 150 mM NaCl, 1% NP-40, 1% sodium deoxycholate, 0.1% sodium dodecyl sulfate). Protein (50 μg) was electrophoresed through a 4% to 15% Tris·HCl Ready Gel (Bio-Rad, Hercules, CA, USA) under reducing conditions and transferred onto a polyvinylidene fluoride membrane. The membrane was incubated with primary antibodies against CBX7 (ab21873; Abcam, Cambridge, MA, USA), E-cadherin (610181; BD Biosciences, San Jose, CA, USA) and β-actin (A5441; Sigma-Aldrich). Immune complexes were detected using horseradish peroxidase-conjugated secondary antibodies and the SuperSignal West Pico Chemiluminescent Substrate Kit (Pierce Biotechnology, Rockford, IL, USA). Our first goal was to generate a set of miRNA expression profiles in primary human healthy and diseased breast epithelia. Therefore, we microdissected 25 samples to enrich for epithelial RNA from 17 patients (see Additional file 1 for representative epithelial lesions) separated into three groups: the control group of normal epithelia from nine patients undergoing RM and the paired diseased groups, which consisted of 16 samples from eight patients (eight samples of HN and eight samples of adjacent ER- and PR-positive DCIS (Table 1). aDCIS, ductal carcinoma in situ; ER, estrogen receptor; PR, progesterone receptor; HER2, human epidermal growth factor receptor 2; IDC, invasive ductal carcinoma in situ; NA, not applicable. Next, to test the reproducibility of the miRNA expression array, we combined equal amounts of RNA from nine RM samples into a pooled RM (PRM). The PRM served both as a heterogeneous biological control and as a technical replicate. The PRM was run in triplicate and showed a high correlation between each replicate with a mean Pearson's correlation of 0.95 (Additional file 2). By comparing the miRNA expression profiles between PRM, HN and DCIS (see Additional file 3 for a list of miRNA expressed in each group), we found that 35 miRNA were differentially expressed (P < 0.005) in at least one comparison (see heatmaps in Figure 1A and Additional file 4, as well as data in Table 2). As expected, the fewest differences were found in the HN-PRM comparison, where 11 miRNA were different (seven overexpressed and four underexpressed). More than twice that number were different in both the DCIS-PRM and DCIS-HN comparisons, with 29 miRNA being different and 23 of 29 overlapping between these comparisons. In the DCIS-PRM comparison, 17 miRNA were overexpressed and 12 were underexpressed; in the DCIS-HN comparison, 15 miRNA were overexpressed and 14 were underexpressed. It has been noted that miRNA that are present within 50 kb at the same genetic loci are often coordinately expressed . We examined these 35 miRNA for coordinate expression because of their close genomic proximity. The 35 miRNA were located at 29 different loci, and 16 of 35 miRNA were clustered at seven distinct loci (indicated in Additional file 4). As expected, 14 (88%) of 16 miRNA < 13 kb apart were positively correlated, with the exception of miR-17-3p and miR-18a. Expression profiling and target prediction of microRNA (miRNA) and genes in histologically normal (HN) and ductal carcinoma in situ (DCIS). (A) and (B) Hierarchical clustering heatmaps of (A) miRNA (P < 0.005, fold change >3) and (B) mRNA (P < 0.05, fold change >1.5) overexpressed (red) and underexpressed (green) in DCIS versus paired HN. Brackets indicate the most significant miRNA and probe sets. Rows, transcripts/miRNA; columns, profiled patient samples; shaded boxes, lesion type. (C) Venn diagram depicting number of predicted functional pairs for each miRNA target prediction algorithm (PicTar, TargetScan and miRANDA) and the intersection of algorithms, first and second queries are separated by a forward slash. aRM, reduction mammoplasty; PRM, pooled reduction mammoplasty; HN, histologically normal; DCIS, ductal carcinoma in situ; microRNA in boldface type have previously been implicated in invasive breast cancer; bP value determined by Student's t-test; cP < 1.7E-02 implies significance with a false-discovery rate of 0.05; dP < 2.5E-04 implies significance after the Bonferroni correction; fold change in expression between comparisons was considered significant if P < 5E-02. To validate our miRNA data set, we searched the literature to determine whether any of these miRNA are implicated in IBC. Twenty (57%) of the 35 miRNA have previously been implicated (noted in Table 2) [13, 14, 18, 29–41]. Eleven of these 20 miRNA were overexpressed in DCIS compared to HN and PRM (miR-181b, miR-200b, miR-200c, miR-18a, miR-21, miR-365, miR-7, miR-182, miR-191, miR-193b and miR-93). The directional change in expression in DCIS of seven (64%) of these 11 miRNA is consistent with their reported expression in IBC; the exceptions are miR-18a, miR-193b, miR-200b and miR-200c. Nine of these 20 miRNA were underexpressed in DCIS compared to HN and PRM (let-7c, miR-10b , miR-125b, miR-127, miR-145, miR-17-3p, miR-195, miR-204 and miR-383), and the directional change in expression in DCIS of eight (89%) of these nine miRNA is consistent with their expression in IBC (except miR-195). Overall, 15 (75%) of 20 miRNA that are dysregulated are concordantly dysregulated in IBC. Of the 29 miRNA dysregulated in DCIS compared to HN, 18 (62%) of 29 are implicated in IBC and concordant with the reported changes in expression. The identification of miRNA targets is crucial to understanding the biological role of miRNA. We have recently shown that gene expression is altered in paired HN and DCIS epithelial cells . Because mRNA destabilization is a mechanism of miRNA-mediated gene repression , we sought to determine whether any of the 29 miRNA altered in the HN-DCIS comparison may participate in the regulation of these differentially expressed genes through this mechanism. First, we examined the gene expression profile from the same 16 paired HN and DCIS samples. Data were analyzed by BADGE. BADGE uses a model-averaging approach to calculate the posterior probability of a fold change > 1 for each probe set and ranks the genes, so that probe sets with a very small probability (< 0.025) or a very large one (> 0.975) are considered differentially expressed. On the basis of the BADGE analysis, we selected the probe sets in which the probability of a fold change > 1.5 was either > 0.975 or < 0.025. These probe sets were further analyzed using a linear mixed model with lognormal errors and random effects to account for patient matching across probe sets. On the basis of this analysis, we obtained a set of 497 probe sets (420 genes) that were differentially expressed (P < 0.05, fold change > 1.5) between HN and DCIS, 208 probe sets (181 genes) that were overexpressed and 289 probe sets (239 genes) that were underexpressed (Figure 1B). The list of probe sets and mean expression values is provided in Additional file 5. We then combined the two expression profiles to identify putative miRNA:mRNA functional pairs linking these 420 mRNA and 29 miRNA. To increase specificity (at the cost of lower sensitivity), we integrated results of three target prediction programs and examined only the intersection. We found that 113 unique miRNA:mRNA target pairs were predicted by all three programs, composed of 74 genes and 13 miRNA (Figure 1C). Returning to the expression data, we found that 59 of 113 miRNA:mRNA pairs (45 mRNA and 12 miRNA) were inversely expressed and that 54 of 113 miRNA:mRNA pairs (46 mRNA and 13 miRNA) were coordinately expressed. The inverse pairs are the canonical understanding of miRNA:mRNA interactions, meaning that as the expression of one changes, it is expected that the expression of the other will change in the opposite direction. The coordinately expressed pairs can represent either false-positive predictions or positive target regulation. The degree of anticorrelation for the inverse pairs was calculated, and the results are listed in Table 3. Similarly, the degree of correlation for the coordinate pairs was calculated, and the data are provided in Additional file 6.
amiRNA, microRNA; miRNA:target mRNA pairs tested in this study are indicated by boldface type, and previously confirmed targets from the literature are indicated by boldface italicized type, bP value determined by Student's t-test. To determine whether a particular molecular or biological function or pathway was overrepresented among the 74 predicted target genes, we conducted gene ontology and pathway analysis. According to these results, 23 (31%) of 74 of the genes regulate transcription. Of the 23, 15 have transcription factor activity, four are transcriptional repressors and nine are sequence-specific DNA-binding factors (see Additional file 7). For example, EGR1 and homeobox A9 (HOXA9) are predicted targets (miR-183:EGR1 and let-7c/miR-182:HOXA9) and are both transcription factors that regulate many genes, including eukaryotic translation initiation factor 4E (EIF4E), collagen type II, α1 (COL2A1), NAB1 and SNAIL (by EGR1), as well as EIF4E and MEIS2 (by HOXA9). Interestingly, these genes were also differentially expressed in the HN-DCIS comparison, and several of these genes are also predicted targets (miR-7:COL2A1, let-7c:NAB1 and let-7c:MEIS2). Because of the use of such a small gene list, no pathways reached a level of significance (see Additional file 8); however, we noted that several genes are associated with cancer-related pathways, such as cell cycle regulation (cyclin D1 (CCND1) and YWHAZ), mitogen-activated protein kinase (MAPK) signaling (fibroblast growth factor 2 (FGF2) and DOK4), nucleotide excision repair (RAD23 homolog B (RAD23B)) and p53 interactions (CCND1, CBX7, enhancer of zeste homolog 2 (Drosophila) (EZH2), WW domain containing E3 ubiquitin protein ligase 1 (WWP1) and PTB4A1). Two of the 59 inverse miRNA:mRNA target pairs we identified have been validated: miR-21:NFIB (an oncogenic interaction) in leukemia cells  and miR-195:CCND1 (a tumor-suppressive interaction) in hepatocellular carcinoma . Our data suggest a new role for these proven interactions in DCIS. We wished to validate additional miRNA:mRNA inverse target pairs. On the basis of a high degree of differential expression in DCIS, multiple predicted targets and potential relevance to cancer, we selected six of 59 inverse target pairs consisting of three miRNA (miR-125b, miR-182 and miR-183) for experimental manipulation in a breast cancer cell line. miR-125b expression is greatly reduced in DCIS compared to HN (0.05-fold) and PRM (0.08-fold). Target prediction analysis identified three inverse putative miR-125b targets (Table 3). We selected MEMO1 and NRIP1 for validation. MEMO1 is a nonheme iron-dependent dioxygenase that binds to the C-terminus of ErbB2/Her2 (also a known target of miR-125b) and is required for ErbB2-driven cell motility [29, 44]. NRIP1/RIP140 is a nuclear protein that modulates the transcriptional activity of the ER . To determine whether MEMO1 and NRIP1 are authentic miR-125b targets, we transiently expressed the precursor of miR-125b in MCF7 cells. This reduced the endogenous expression of MEMO1 as early as 24 hours (0.75-fold), and expression was significantly further decreased at 48 hours (0.62-fold) and remained below baseline at 72 hours (0.84-fold). Similarly, the expression of NRIP1 was reduced at 24 hours (0.63-fold), and expression was significantly further decreased at 48 hours (0.53-fold) and remained below baseline at 72 hours (0.68-fold) (Figure 2A). These results suggest that both MEMO1 and NRIP1 are negatively regulated by miR-125b. Effect of miR-125b overexpression and miR-182 and miR-183 knockdown on predicted target gene expression. (A) Reduced average relative fold change in expression of predicted miR-125b targets: mediator of ErbB2-driven cell motility 1 (MEMO1) (*P < 0.08) and nuclear receptor interacting protein 1 (NRIP1(RIP140)) (*P < 0.05). (B) Increased average relative fold change in expression of predicted miR-182 targets: chromobox homolog 7 (CBX7), docking protein 4 (DOK4) and N-myristoyltransferase 2 (NMT2) and miR-183 target early growth response 1 (EGR1) (*P < 0.05 and **P < 0.02). Target mRNA expression was measured at 24, 48 and 72 hours posttransfection (n = 4, all conditions). Significant differences were determined by Student's t-test. Error bars indicate standard error of the mean. miR-182 and miR-183 expression is greatly increased in DCIS compared to HN (72.35- and 51.88-fold, respectively) and to PRM (106.24- and 19.06-fold, respectively), and they are slightly increased in HN compared to PRM (2.0- and 2.52-fold, respectively). Target prediction analysis identified 13 inverse targets of miR-182 and four inverse targets of miR-183 (Table 3). We selected CBX7, DOK4 and NMT2 for miR-182 validation and EGR1 for miR-183 validation. CBX7 is a chromobox family protein and a member of the polycomb-repressive complex 1 that positively regulates E-cadherin expression through interaction with HDAC2 . DOK4 acts as an anchor for c-Src kinase, inhibits tyrosine kinase signaling and can activate MAPK [47, 48]. NMT2 is a N-myristoyltransferase, and myristoylated proteins have diverse biological functions in signal transduction and oncogenesis . EGR1 is a Cys2His2-type zinc finger protein that functions as a transcriptional regulator of target genes required for differentiation and mitogenesis . To determine whether these genes are authentic targets of miR-182 and miR-183, we introduced an antisense RNA specifically designed to knock down the expression of mature miR-182 and miR-183 into MCF7 cells. We observed that from 24 through 72 hours, there was an upward trend in expression for each of the target genes, which was significant for three of the four targets at 72 hours. By 72 hours, the increases in endogenous expression were 1.23-fold for CBX7, 1.13-fold for DOK4 and 1.34-fold for NMT2. EGR1 was unexpectedly decreased at 24 hours (0.46-fold), but its expression had returned to baseline at 48 hours and was increased at 72 hours (1.2-fold) (Figure 2B). It has been suggested that the loss of CBX7 expression may influence the invasiveness of epithelial cancers by promoting an epithelial-to-mesenchymal transition . This effect is believed to be due to CBX7's ability to promote the expression of E-cadherin, a cell adhesion molecule that plays a role in maintaining normal epithelial cell morphology by associating with and inhibiting the repressive action of HDAC2 within the E-cadherin promoter region. Loss of E-cadherin expression during neoplastic progression is associated with several cancers, including breast cancer. In this study, the expression of CBX7 was reduced 0.44-fold in the DCIS-HN comparison; however, we did not observe a significant decrease of E-cadherin in our preinvasive clinical samples. It may be that the loss of E-cadherin expression is more characteristic of the invasive transition or of lobular histology. However, we asked whether upregulation of CBX7 due to the reduction of its targeting miRNA (miR-182) would also lead to upregulation of E-cadherin expression in vitro. We found that by 48 hours postknockdown of miR-182, the protein levels of both CBX7 and E-cadherin were upregulated by approximately 35% to 40% relative to control (Figures 3A and 3B). Effect of miR-182 on chromobox homolog 7 ( CBX7 ) and E-cadherin expression. 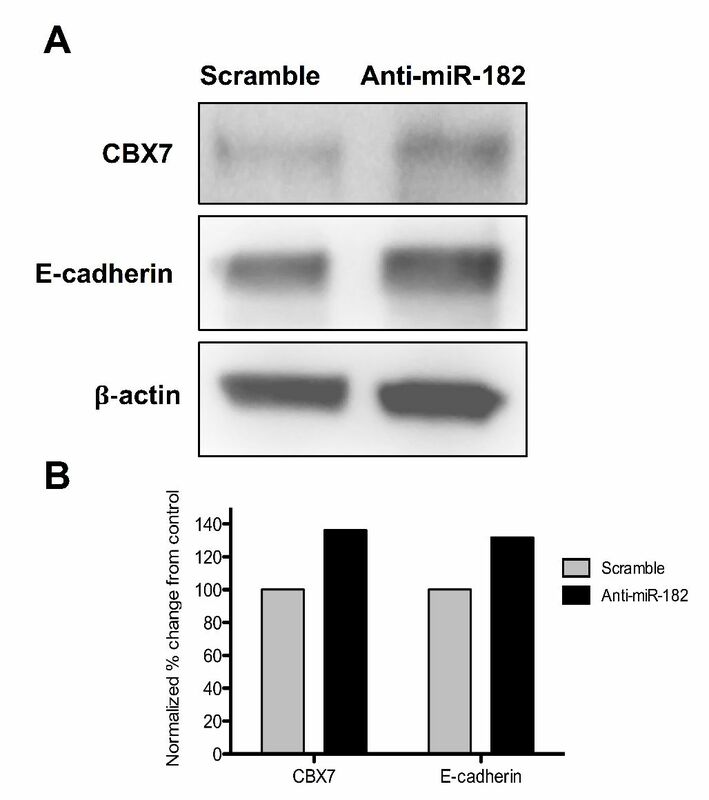 (A) Protein levels of CBX7 and E-cadherin after transfection with anti-miR-182 or scramble. β-actin served as a loading control. (B) The percentage changes in levels of CBX7 and E-cadherin were quantitated and normalized for β-actin. In this study, we identified a set of miRNA that are expressed in normal breast epithelium and found that major miRNA expression changes occur at the transition from normal to DCIS epithelium, thereby defining a set of putative oncogenic and tumor suppressor miRNA that are dysregulated at the preinvasive stage of breast cancer. A greater number of miRNA were expressed in PRM compared to HN and DCIS, which is contrary to what we have observed in our gene expression studies, and we recognize that the high Ct cutoff values employed could have influenced these results [15, 16]. However, this observation fits with the current understanding of miRNA regulation of mRNA expression, given that a greater number of expressed miRNA would correspond to fewer expressed mRNA. Twenty of these miRNA have previously been implicated in IBC, and 62% of the miRNA dysregulated in the HN-DCIS comparison are directionally concordant with miRNA dysregulated in IBC. This work identifies a role for these previously implicated miRNA at an early stage of breast cancer development. For example, we found that miR-145 expression was underexpressed in the DCIS-HN comparison. Using an in situ hybridization approach, Sempere et al. found that miR-145 was restricted to the myoepithelial/basal cell compartment of normal mammary ducts and lobules and was reduced or absent in matching tumor specimens. This finding lends support to our discovery of decreased miR-145 in DCIS, because we know that our epithelial samples include myoepithelial cells. Although we observed a high concordance rate with previous reports in IBC, in contrast to the seminal study by Iorio et al. , which examined miRNA expression in bulk tumor tissue versus normal tissue, miR-155 was identified as highly overexpressed in breast tumor tissues. However, miR-155 was not differentially expressed in any of our comparisons. This suggests that either miR-155 is an invasive, specific miRNA or its expression is not epithelium-specific, and also that it was detected because of the heterogeneous cell population presenting bulk tumor tissue. miR-155 has since been described in immune cell function, which supports the latter scenario . Comparison of our data set to others may shed light on other miRNA whose expression is specific to either cancer stage or a particular cell type. The identification of miRNA targets is crucial to the understanding of their biological role. We hypothesized that there is a coordinate mechanism of dysregulation between the abnormal expression of miRNA and target mRNA in very early breast tumorigenesis. By combining miRNA and gene expression data and integrating miRNA target prediction, we obtained a set of candidate miRNA:mRNA target pairs. Approximately one-half of these target pairs were coordinately expressed and are either false-positive predictions or may in fact positively regulate the target mRNA, albeit a less well-understood phenomenon. However, several instances of miRNA-positive regulation of a target gene have been described [52–54]. In addition, it has been noted that two classes of miRNA network motifs, corresponding to positive and negative regulation of a miRNA and its target, may coexist, and in neuronal cells miRNA tend to be coexpressed in the same direction as their target genes . This may in part explain our observations, although further studies are needed. Our approach has identified many potentially important early-acting, cancer-promoting mRNA targets, and miRNA dysregulation is a potential mechanism causing these early mRNA changes. Many of the identified target genes have known cancer or anticancer activity. For example, TXNIP (thioredoxin-interacting protein), EGR1, CBX7, HOXA9 and FOXN3 (checkpoint repressor 1) have tumor suppressor functions and are targeted by the potentially oncogenic miRNA miR-93, miR-183, miR-181b, miR-182 and miR-7. Similarly, WWP1, SDC1 (syndecan 1), EZH2, CCND1, ADAM9 and MEMO1 have oncogenic activities and are targeted by the potentially tumor suppressor miRNA miR-195, miR-10b, let-7c, miR-17 and miR-125b. Many of these target pairs are likely to be relevant to cancer in general and breast cancer in particular; however, we could validate only a subset of these. We found that with modulation of miR-125b, miR-182 and miR-183 expression, we obtained results that suggest these miRNA do regulate the expression of their predicted target genes. The expression of miR-125b is reduced in many cancers, including breast cancer [13, 56] and serous ovarian carcinoma . In addition, it has been established that miR-125b targets ErbB2/Her2, and by also targeting MEMO1, which interacts with ErbB2/Her2, miR-125b is regulating two functionally related genes. miR-182 and miR-183 are clustered at 7q31.2, a region that is frequently amplified in melanoma , and both miRNA are commonly codysregulated in many cancers, including prostate, colon and breast cancer [33, 59, 60]. In this study, we found that by suppressing the expression of miR-182 and miR-183 in vitro, the expression of their four predicted targets, CBX7, DOK4, NMT2 and EGR1, were upregulated. Two of these, CBX7 and EGR1, have well-described tumor suppressor functions, and recently DOK4 family members (DOK1, DOK2, and DOK3) were identified as lung tumor suppressors . In addition, the secondary effect of miR-182 repression resulting in upregulation of E-cadherin through CBX7, which we have shown, may have important implications in reversing epithelial neoplasias to a more normal state. Furthermore, in future studies, combined modulation of miR-125b, miR-182 and/or miR-183, as well as other miRNA altered in DCIS, may be effective in reversing the forward progression to IBC. Admittedly, our study has several limitations, most notably the small sample size and the inclusion of only ER- and PR-positive DCIS. With the use of microdissected, paired breast tissue samples and robust statistical analysis, we sought to minimize potential biases elicited by small the sample size. In fact, the many similarities between our miRNA expression profile of DCIS and others' miRNA expression profiling of IBC suggest that our results are reliable. However, an expansion of this study to include other histological categories could identify subtype-specific dysregulated miRNA. The present study provides the first report of a miRNA expression profile in normal breast epithelium and the first integrated analysis of miRNA and mRNA expression in paired samples of histologically normal and preinvasive breast cancer. We have further demonstrated, by modulating the expression of several miRNA, that the expression of their predicted target genes is affected. Taken together, these findings support our hypothesis that changes in miRNA expression in early breast cancer may control many of the parallel changes in gene expression at this stage. This work also implicates the loss of the tumor suppressor miR-125b and the gain of the oncogenic miRNA miR-182 and miR-183 as major contributors to early breast cancer development. Additionally, this study has revealed novel candidate markers of preinvasive breast cancer, which could contribute to the identification of new diagnostic and therapeutic targets. The miRNA and miRNA:mRNA target pairs identified in this study are natural candidates for future investigations. The authors acknowledge PHS award CA115434, the Avon Foundation and the LaPann Foundation for their financial support. BNH is supported by a Predoctoral Traineeship Award from the Department of Defense, USAMRMC W81ZWH-08-1-0254. We thank Kelly Graham, Chialin King and Lyndsey Emery for the use of microarray sample data and Beth Hovey for technical advice regarding immunoblot analysis. BNH conceived of and designed the study; executed miRNA expression profiling, subset of gene expression profiling, target prediction and target validation; and drafted the manuscript. PS participated in the design of the study and performed gene and miRNA expression statistical analysis. AdlM reviewed and identified lesions on all histological slides. JL provided expert technical advice and helped to design the validation experiments. CLR conceived of the study, participated in its design and coordination and helped to draft the manuscript. All authors read and approved the final manuscript.